I should really draw up an indie map one day; granted most of this stuff will be Oxford, Glasgow or Manchester-based, but here's another entry for the agricultural wastelands of Suffolk. Jacob's Mouse were a rather nice indie rock band with, and I feel this is important, identical twin brothers Jebb and Hugo Boothby playing bass and guitar. I don't think I've featured twins before; identical or otherwise. "...despite some critical acclaim, and a successful UK tour supporting Babes in Toyland and Trumans Water, they failed to take the wider world by storm. 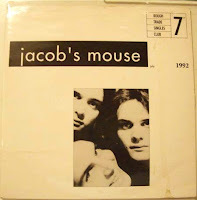 Following the release of their Rubber Room LP in 1995, Jacob's Mouse split." There's a good full biog on the Wiija site, so pop along there for more and as usual TrouserPress know all. They seem to get tagged as "grunge" around the internet which seems rather unfair. Granted some of their stuff is more rock than the jingly jangly indie stuff we all know and love, but still. They recorded a couple of Peel Sessions and released some cracking records, so hats off to them and welcome to the blog. This particular mp3 is a good ones as well, Jacob's Mouse - Company News, it's from the legendary Rough Trade Singles Club as well, nicely. Oh, and you can buy Jacob's Mouse "No Fish Shop Parking" here. Another band that was brought to my attention by an email, this time by a very nice chap called Martin. The band in question? 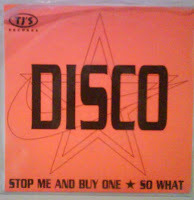 Disco. No, me either. "a simpering, simmering cauldron of feisty, femme-tastic shenanigans... All bloody marvellous." Well, I guess that's one way of putting it. Listen to the mp3 below; it's rough and exciting in a 'two girls shouting into a bin' way. I managed to hunt a copy of this single down from a very helpful Dutch chap at a record shop called Distortion Records in Amsterdam (and if I'm ever in that fine city again I'm certainly popping in to see them; Amond was a great help). A bit of an odd one this, the Gigolo Aunts are American, but couldn't sound more indie if they tried. Well, if they tried any harder to sound like Teenage Fanclub anyway. It's a bit of a shame really, as a band they were pretty good and they knocked out some cracking indie pop; unfortunately they never really took off over here and were kind of swamped by all the other American bands doing bloody grunge, just as they started to make their name. They did of course have a massive hit in "Where I Find My Heaven" which featured in "comedy" film Dumb and Dumber and in the late-but-not-really-lamented sitcom "Game On" which featured the comedy stylings of Samantha "let's just forget Eurovision, please!" Janus, the ginger chap who does the adverts and the hilarious bloke who wouldn't leave the flat. I went to see them in a comeback gig in what must have been 1998 or 1999 at The Garage in Highbury; all the way through you just knew the audience were waiting for them to do the song. To their credit they did; they saved it for a show-stopper at the end. I remember them doing it twice, but I may be wrong. Anyway, they deserved better, they produced some lovely indie pop and if they'd made it big(gish) 3 years earlier we'd still be talking about them. 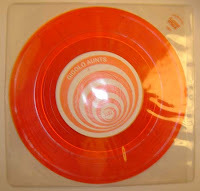 Here for your listening pleasure, copied from the coloured vinyl 7", here's Gigolo Aunts - Mrs Washington, complete with scratches and a skip or two. just so you can see that they had more than one song. You can buy the Gigolo Aunts "Best of" here. And ok, here's THE SONG. Sorry lads. Still, that's some mighty fine indie hair. The Orchids are an odd band. Sarah Records stalwarts and creators of swooping melodies and electronica-influenced pop. Formed in Glasgow in the mid 1980s and lasting until around 1993/1994 the band were moderately popular and certainly had fans at the NME (when that still counted for something); but they never made it really, really big. There we reissues of all the old material in 2004 and they've reformed recently. 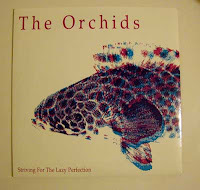 Check out the official site for all you Orchids needs and, again, the wiki has a lot of the information you need and this: The Orchids - Striving for Lazy Perfection is a lovely bit of cool, relaxed indie pop. Enjoy. Oh, and again, you can buy loads of their stuff here .